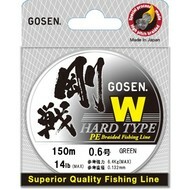 Gosen W hard type 150m PE:1.5 30lb 0.126Gosen W Hard type braid PE. High sensitivity, low stretch and high durability, the line is produced with special process "high pitch” That’s lots of tiny lines. 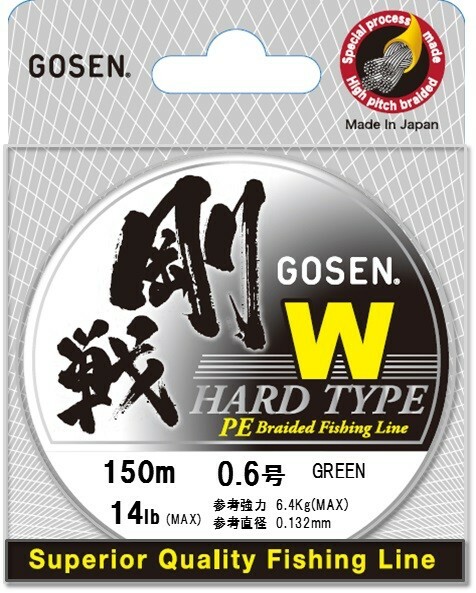 Gosen W hard type 150m PE:1.5 30lb 0.126Gosen W Hard type braid PE. High sensitivity, low stretch and high durability, the line is produced with special process "high pitch” That’s lots of tiny lines. Hard texture reduces wind knots, tip wrap and backlash. Low water absorption means less line slap, better distance and an fast sink rate. New SG process smaller intervals of each multifilament gives high strength, special coating increases abrasion resistance and hard texture. 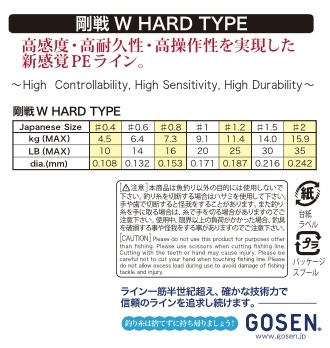 Manufactured with Izanas fibres,, the strongest man made fibre.